A new video by La Vía Campesina and GRAIN is part of a campaign to highlight the key role of the industrialized food system to the climate crisis. 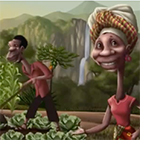 The video provides accessible information to understand the six main impacts of the agroindustrial food system that contribute to global warming: deforestation, industrial farming, transport, processing, refrigeration and food waste. In the Americas, Asia, Europe and Africa, for many years, people have been criticizing false solutions to climate change like GMOs, the “green” economy, and “climate-smart” agriculture. The solution to the climate crisis is in the hands of small farmers, along with consumers who choose agroecological products from local markets. This is the message to take to the Paris Climate Change Conference this December. Join the campaign! Share this video!